Rowers like pulling hard. On the erg and in the boat. It’s what gives us speed and makes us feel good. It makes us feel like we’re doing something honest and playing by the cardinal rule of rowing and erging – pull hard and go faster. But given that you spend most of your time erging and rowing at a rate below 24 strokes per minute you end up pulling A LOT of hard, slow strokes. You teach yourself to mainly pull slow hard strokes when all the money is at fast hard strokes. How You Can Fix It. Always finish your session with a stepped sprint. Whether it’s an hour long erg or a short series of 500 meter intervals, always finish the last work piece flat out. Why? Because you will benefit massively in millions of ways – both physically and mentally. Your body will adapt and respond to the increased stimulus you heap upon it at a point where you are under a lot of stress and fatigue. It will learn to expect that every rowing session you do will have a sprint to the finish. This is a great weapon to have in your armoury for tight races. Your mind will also respond in a positive way to finishing the session on a high. You will come away feeling good even if you didn’t have a good row. You will also come to realise that you will always be capable of going harder (and faster) no matter how tired you are coming to the line. But what about your long steady session? Yes, even if it’s a long 1 hour row on the erg, you should still sprint to the line. From about 3 minutes left, step up your rating and power slightly (1 second per 500). Do the same with 2 minutes left. Then in the last minute start to slowly nail it. Incrementally increase your power and rating so that in the last 20 seconds you are all out – recruiting every muscle fibre and brain power in your possession. The same goes for shorter rowing workouts. Over time if you practice a sprint in the long sessions you will develop an ability to sprint for short sessions also. Even if you are only able to reduce your average power by 0.5 seconds per 500 it will be worth it. Sprinting is a great habit to develop. And it will not affect the general core purpose of a particular rowing session. Introduce it to your rowing and erging sessions and one day when you find yourself in a dog fight use it to blow your opposition away. P.S. Read the follow up to this article, where I clarify some interesting questions raised by one of our readers. Does optimal stroke count vary significantly per individual? Sprinting too? I wouldn’t say that it does vary between individuals. Sometimes by a lot. And depends on your rowing style, technique and strength. 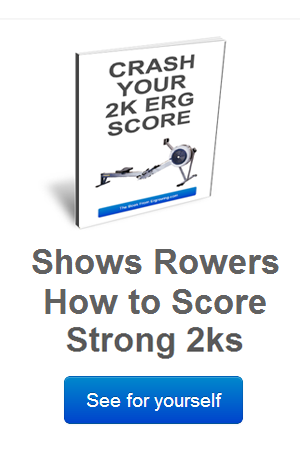 I’ve seen people score well in all grades and abilities of rowing and erging rate between 30 and 38 in a 2k erg. So I guess that band is significant. Funnily enough, the optimal sprinting stroke rate I’ve seen varies even more. Maximum 20 second tests can be anywhere from 38 – 52 spm. There is a follow up to this article that I’ve attached at the end of the article after I got a lot of questions about it. Good Luck with your erging! Thanks. To me, the high 30’s feels natural (I’m only doing 20 minute workouts so far including warm-up). I can do a better split if I slow down and pull harder, but I can’t maintain even 2:00/500 for very long. My thinking is to build stamina and strength before even trying for a 2k time. I am a prime heart attack candidate (late 40’s, former athlete, 20 pounds later, thinks he can still go fast…) but at least I’ve learned to be patient and not overtrain. 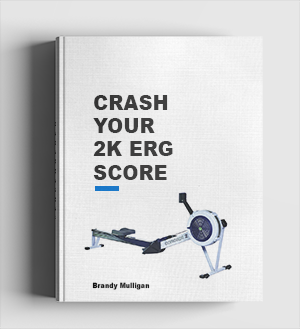 i really need to work on my power and getting stronger for my next 2k erg test, i recently rented a concept 2 erg at home and now i was wondering what workouts you would reccomend to increase my power and strength over the next few months..
You should work on low stroke rate and high power. 20 SPM building your power per stroke up to 40 minutes. This will help your power, strength and endurance.